The first time Mario Terán faced a doctor from Cuba, he killed him. He heard Che Guevara utter his famous last words: "Shoot, coward; you are only going to kill a man," and in October of 1967, in a small schoolhouse in rural Bolivia, Sergeant Terán fired a round of bullets into the revolutionary's body. Forty years later, Terán walked into a medical clinic staffed by Cuban physicians. Disguising his identity, he requested medical attention. His cataracts were corrected, his sight restored. Like hundreds of thousands of other Bolivians, Che's killer is a beneficiary of Operación Milagro (Operation Miracle), the cornerstone of Cuba's programs of social solidarity in the country. In addition to almost 2,000 Cuban medical personnel in Bolivia, aid from Cuba and Venezuela has funded the opening or expansion of at least 20 hospitals and 11 eye clinics across the country. The support falls under the rubric of what President Evo Morales calls the "Peoples' Trade Agreement" (TCP)-also known as the Bolivarian Alternative for the Americas (ALBA) or TCP-ALBA-a regional integration accord signed in April 2006 that seeks to depart from the free trade model. Based upon principles of solidarity, cooperation and complementarity, the agreement recognizes asymmetries between countries and provides the greatest advantages to those with the smallest economies-in this case Bolivia. What Cuba has, and is uniquely able to deliver under the framework of the TCP-ALBA, is a massive surplus of skilled physicians that the socialist country has been sending abroad since its first medical mission to Algeria in 1963. Much as they do at sites across Bolivia, Cuban doctors work side-by-side with Bolivian physicians at the San Francisco de Asis Hospital in the rural town of Villa Tunari, nestled in the tropical El Chapare region. A Bolivian administrator explains that the hospital staff is comprised of 68 Cubans integrated with the 72 Bolivians who work there. Of the three surgeons, two are Cuban. The government of Cuba covers all of the expenses of their doctors, and they do not charge for services. One of the Cubans on site proudly asserts that in the span of one year his team had seen more than 30,000 patients, and conducted 400 surgeries. At a national level, Bolivia's TCP-ALBA Coordination Team documented that in 2007 Cuban medical personnel had provided services to around three million Bolivians. The following year, a BBC article reported the number of consultations had surged to nine million. Government figures from 2009 indicate that more than 260,000 Bolivians had undergone eye surgeries through Operación Milagro. But not everyone in Bolivia is thrilled about the Cubans' presence. Foremost among the critics is the profession's trade association, the Bolivian Medical College, which claims that the Cuban physicians are unqualified and ignorant of Bolivian customs related to matters of health. Moreover, the College argues that the influx of foreign doctors deprives Bolivians of work. The proposition of substituting Bolivian for Cuban doctors has resonated with many in the medical community. In an outlying neighborhood of El Alto, a Bolivian doctor, speaking anonymously, expressed that, while he does not oppose the Cuban teams, he shares the sentiment of the Medical College: "This money should go to Bolivian doctors, not to Cubans, we say. There are unemployed Bolivian doctors. They should give the work to them, not to foreigners." Many doctors contest the profession's official narrative, including Cochabamba physician Godofredo Reinicke, once El Chapare's Human Rights Ombudsman, and now director of the human rights group Puente Investigación y Enlace. Reinicke explains: "The Medical College has rejected the Cubans' presence because... it lacks the solidarity that it once had with the people; the doctor has become some sort of mercantilist. For me, the presence of [Cuban] doctors in particular is aid of utmost importance. [They are] advancing the theme of solidarity for doctors and common citizens to see how people can work without the necessity of pressure, conditionality or money." Nationality aside, few would contest that the Bolivian health care system suffers from insufficient facilities and personnel. According to a 2004 World Bank report, the number of Bolivian medical practitioners per capita was half of the Latin American average, with only 6.6 doctors and 3.4 nurses for every 10,000 people. The Bank estimated that an additional 8,850 health professional and many more health facilities were needed in Bolivia. "Seventy-seven percent of the population is excluded from health services in some manner," explained Bolivia's former Health Minister Dr. Nila Heredia in her 2006 presentation before the World Health Organization. "This reproduces in the field of health those inequalities and injustices of the economic structure." Under Bolivia's system, the country's elite nets five times more in health care expenditures than those with the lowest incomes. Social security and private health care, which together represent four-fifths of all health care expenditures, are highly regressive. The World Bank found that only around 4% goes to poorest 20% of the population, while almost half is enjoyed by the richest quintile. Rural residents are especially disadvantaged, with many effectively lacking any access to health care services. While medical solidarity from Cuba, Venezuela and other donor countries has been helpful in confronting Bolivia's uneven health care landscape, it is not a permanent fix. In the end, Bolivians should be seeing Bolivian doctors, a point implicitly acknowledged by the several thousand scholarships provided to Bolivians to study medicine in Cuba and Venezuela. The Morales government has also initiated a series of domestic programs to increase health services. A newly announced mother-child subsidy called "Juana Azurduy" provides cash payments to pregnant women and mothers with babies through their second year, so long as they maintain pre- and post-natal checkups. Nutritional and vaccination campaigns have been initiated and expanded to combat malnutrition and diseases such as yellow fever and rubéola (measles). And in an effort to transcend the dominance of the "biomedical" model, the newly approved Constitution (January 2009) guarantees and promotes the use of indigenous medicines and "ancestral knowledge and practices." Although these reforms signify important advances, there remain significant structural, budgetary and ideological challenges fundamental to the design of Bolivia's health care system. 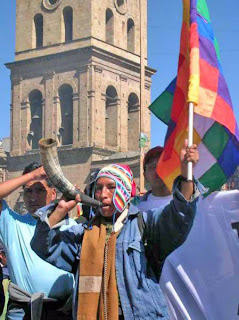 Debates over privatized care, unequal access, lack of funds, and the prioritization of biomedical disease treatment over the promotion of health and traditional medicines are by no means unique to Bolivia. Yet they sit uncomfortably at odds with the new Constitution's promise of "universal, free, equitable, intracultural" access to health care for all Bolivians. Lifting Bolivia from close to the bottom of the hemisphere's health indicators will be a difficult task for Morales, much as it was for his predecessors. The initiatives he has implemented to date provide, at best, partial answers. But while Bolivia awaits more durable solutions, the government's immediate approaches have won accolades from many Bolivians, with the importation of Cuban medical professionals being a particularly popular measure. "The Cubans are well received by those who have visited them and been attended as patients," the mayor of a town in El Chapare told me. "I welcome them because they are the support the population needs."